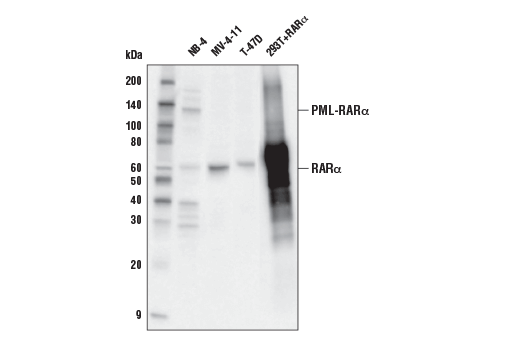 Western blot analysis of extracts from various cell lines using RARα (E6Z6K) Rabbit mAb. The NB-4 cell line contains the PML-RARα fusion protein. Immunoprecipitation of RARα and PML-RARα from NB-4 cell extracts. Lane 1 is 10% input, lane 2 is Rabbit (DA1E) mAb IgG XP® Isotype Control #3900, and lane 3 is RARα (E6Z6K) Rabbit mAb. 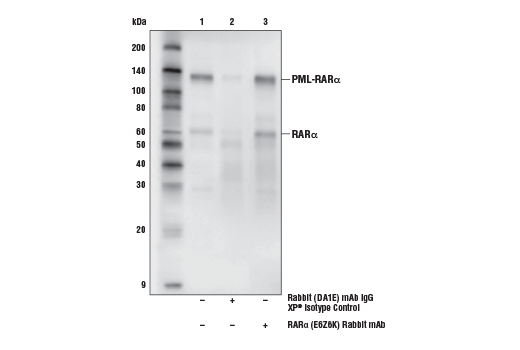 Western blot analysis was performed with RARα (E6Z6K) Rabbit mAb. The NB-4 cell line contains the PML-RARα fusion. Mouse Anti-rabbit IgG (Conformation Specific) (L27A9) mAb (HRP Conjugate) #5127 was used as a secondary antibody. Chromatin immunoprecipitations were performed with cross-linked chromatin from NB-4 cells and either RARα (E6Z6K) Rabbit mAb #62294 or Normal Rabbit IgG #2729 using SimpleChIP® Plus Enzymatic Chromatin IP Kit (Magnetic Beads) #9005. The enriched DNA was quantified by real-time PCR using SimpleChIP® Human RUNX1 Exon 2 Primers #67254, human GFI promoter primers, human GFI exon 4 primers, and SimpleChIP® Human α Satellite Repeat Primers #4486. The amount of immunoprecipitated DNA in each sample is represented as signal relative to the total amount of input chromatin, which is equivalent to one. 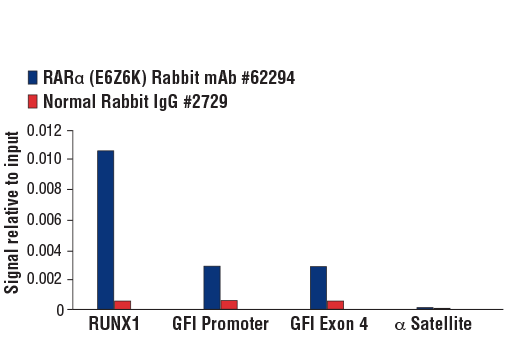 RARα (E6Z6K) Rabbit mAb recognizes endogenous levels of total RARα protein. This antibody weakly detects RARγ when it is overexpressed. Monoclonal antibody is produced by immunizing animals with a synthetic peptide corresponding to residues surrounding Leu220 of human RARα protein. Retinoids (vitamin A and its active retinoic acid derivatives) are non-steroid hormones that regulate cell proliferation, differentiation and apoptosis. Retinoic acid receptors (RARalpha, -beta and -gamma) and retinoid X receptors (RXRalpha, -beta and -gamma) are nuclear receptors that function as RAR-RXR heterodimers or RXR homodimers (1-2). In response to retinoid binding, these dimers control gene expression by binding to specific retinoic acid response elements, by recruiting cofactors and the transcriptional machinery, and by indirectly regulating chromatin structure. Finally, ligand binding and phosphorylation of RARalpha by JNK at Thr181, Ser445 and Ser461 controls the stability of RAR-RXR through the ubiquitin-proteasome pathway (3-4). At least four distinct genetic lesions affect RARalpha and result in acute promyelocytic leukemia (APL). The t(15;17) translocation that results in the PML-RARalpha fusion protein is responsible for more than 99% of APL cases, and the fusion protein inhibits PML-dependent apoptotic pathways in a dominant negative fashion. In addition PML-RARalpha inhibits transcription of retinoic acid target genes by recruiting co-repressors, attenuating myeloid differentiation (5-6). Mangelsdorf, D.J. et al. (1995) Cell 83, 835-9. Mangelsdorf, D.J. and Evans, R.M. (1995) Cell 83, 841-850. Bastien, J. and Rochette-Egly, C. (2004) Gene 328, 1-16. Srinivas, H. et al. (2005) Mol. Cell. Biol. 25, 1054-1069.
de The, H. et al. (1990) Nature 347, 558-561. Slack, J.L. and Rusiniak, M.E. (2000) Ann. Hematol. 79, 227-238.